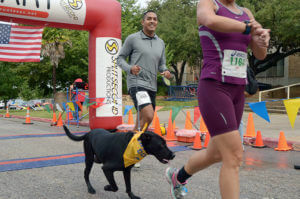 Hundreds of runners and walkers of all ages — many with their dogs — will lace up and leash up on Saturday, Oct. 20, for the University’s fifth annual 5K run/walk — the StMU 5K for the Neighborhood. Proceeds from those running with a purpose this year will help benefit St. Mary’s next-door neighbor, Holy Rosary Catholic Church, which is led by Marianist priests and brothers. Funds from the event will enhance services and outreach programs in the St. Mary’s Gateway District. Past races have benefited the United Way, the Neighborhood Place and the Society of St. Vincent de Paul, funding family assistance programs and parenting education services for those with limited resources. The StMU 5K is part of an ongoing effort to enhance quality of life through neighborhood revitalization. St. Mary’s strives to be a vital partner in promoting the health and wellness, education and safety of the community near the campus. When: Saturday, Oct. 20. Opening remarks at 8:45 a.m. 5K begins at 9 a.m.
Where: St. Mary’s University campus. Start/finish at Alkek Plaza. Registration: Online or on race day at 7:30-8:45 a.m. Parking: In front of campus in Lots V and S or at the back of campus in Lot D. For more info, visit our campus map. Amenities: Food, beverages and live music after the 5K. Awards ceremony at 10 a.m.
Wednesday, Oct. 17, 10 a.m.-7 p.m.
Thursday, Oct. 18, 1-7 p.m.
Friday, Oct. 19, 9 a.m.-5 p.m.
Saturday, Oct. 20, 7:30-8:45 a.m.